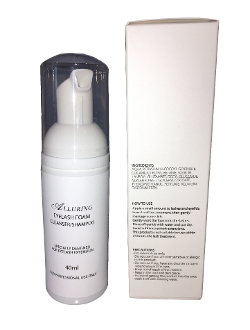 The Alluring eyelash foam cleanser / shampoo is gentle on extensions as it washes away everyday dirt, oil and makeup residue. Our Foaming Lash Cleanser is a great choice for technicians and clients. Regular lash cleaning is an important factor in maintaining the longevity of lash extensions. Using this product 3-4 times a week will ensure that your natural lashes are perfectly primed for new extensions. Please note: this product is not suitable for use within 24 hours of a lash treatment, as contact with moisture while extension glue is curing will interrupt the bonding process. Great to retail it to your clients for daily use.